Rivlin, Gary. 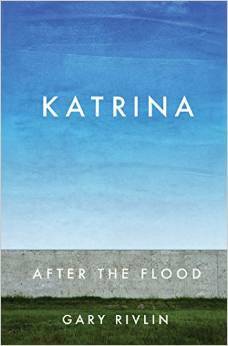 “Katrina: After the Flood”, Simon and Schuster, 2015. On August 29, 2005, Hurricane Katrina made landfall in southeast Louisiana. That was ten years ago. Many have forgotten Katrina but I can guarantee you that those of us who experienced Katrina first hand will never ever forget what it was like. There is something magical about New Orleans especially to those who call it home. I am one of those who once called New Orleans home. It was I grew up and was educated, where my friends were and where I learned about life. But I left New Orleans for a very long time and had just come back right before Katrina hit. I had not been there in a very long time but instead of having the chance to reacquaint myself with the city, I got to attend something of her funeral. I did learn, as I had heard so many times from others, that a New Orleaninan remains one his entire life—New Orleans is the kind of city that it is impossible to forget. New Orleans is Mardi Gras, red beans and rice, jazz and jazz funerals, the French Quarter, Jazz Fest and the Saints and neutral grounds, “zinks” and banquettes. We make groceries on Thursdays, do laundry on Mondays and play all week. Katrina tried to change all that and almost did. She did for me any way. I left New Orleans and I am not going back but New Orleans is with me all the time. In this book, journalist Gary Rivlin traces the storm’s immediate damage to New Orleans, the city’s efforts to rebuild itself, and the storm’s lasting affects not just on the city’s geography and infrastructure—but on the psychic, racial, and social fabric of one of this nation’s great cities. I was evacuated out of New Orleans three days after the storm hit and the water continued to rise. I did not return to see what happened until almost five years later having settled in Little Rock, Arkansas. When writer Rivlin first saw the city after Katrina hit, she was still under water and as he traveled into the city proper there were soldiers in uniform and armed with assault rifles that stopped him. Water reached the eaves of houses for as far as the eye could see. He saw that four out of every five houses—eighty percent of the city’s housing stock—had been flooded and proportionally the same amount of schools and businesses were wrecked. The weight of the water on the streets cracked gas and water and sewer pipes all around town and the deluge had drowned almost every power substation and rendered unusable most of the city’s water and sewer system. People who living in flooded areas of the city could not be expected to pay their property taxes for the foreseeable future. Nor would all those boarded-up businesses—21,000 of the city’s 22,000 businesses were still shuttered six months after the storm and they surely could not pay the taxes and other fees to the city. Some six weeks after the storm, the city unloaded half of its workforce at a time when so many people were turning to its government for help. What about the use of taxpayer dollars to rebuild a city that sat mostly below sea level and everyone wondered could the city possibly come back. Rivlin looks at the stories of a variety of New Orleaninans—politicians and business owners, teachers and bus drivers, poor and wealthy, black and white as they deal with the aftermath of one of the great tragedies of our age and try to Bring New Orleans back by reconstructing and changing while others abandoned the city. The questions seem to have never stopped— How is New Orleans doing? Is she back? What about the Lower Ninth Ward? It becomes hard to ask about people and places that were loved. We forget sometimes that New Orleans was not just a place but that there were people there. Trying to answer questions we hear that “New Orleans is doing terrifically and terribly. It’s back but different and currently undergoing a furious transformation. Much of the Lower Ninth Ward is not O.K”. But these are incomplete answers. These questions lead to those that really get to the issue. Those are the questions that Gary Rivlin asks. Only now, ten years after the storm are we finally getting the story of the recovery of the city. But there is no recovery if we look at the definition of the word. What was lost is gone forever and no one knows what will tale its place. Rivlin shares the decisions that have brought us this far, and to identify those who made them. To write about Katrina ten years later is impossible to do without going back to August 2005 when Katrina was heading for shore. It was a feeling that I had never experienced before; a kind of curiosity mixed with apprehension and fear. I did not believe it was going to hit on one hand and on the other I was sure we would not get out this safely. Rivlin spent much of the first year after Katrina living in New Orleans and Baton Rouge on assignment for The New York Times. While much what was reported by the press then dealt with the faulty levees, the terrible conditions in the refugee camps and rumors of violence, Rivlin found himself more concerned with what was yet to happen to New Orleans and he wondered how the city with one of the nation’s highest rates of poverty and crime would recover from the most expensive natural disaster in American history? If the city was to have a future, who was going to make the calls? Where would the suffering take place and how much worse would the city’s low-income black population be made to suffer? Rivlin then chose to concentrate on a cross-section of residents: “old-money millionaires, a middle-class black family in New Orleans East, white transplants turned political activists, and Lower Ninth Ward natives determined to rebuild their neighborhood despite deep opposition and deeper indifference”. Three local power brokers are the center of the story and these three allowed Rivlin to gain immediate access to them. We meet real estate mogul Joseph Canizaro, a personal friend of George W. Bush, who talks of “planning” a city, as if to say that there has been no New Orleans before Katrina; Alden McDonald, president of Liberty Bank, one of the nation’s largest African-American-owned financial institutions (The success of the bank and the success of the black neighborhoods go hand in hand); and the former mayor Ray Nagin, whose incompetence is totally visible here in detail. Rivlin compares him to Osama bin Laden, Richard Nixon and Willy Wonka. It is amazing and heartbreaking to read about the “dysfunctional, tedious and often corrupt horse trading that dominated these early innings — the expert commissions and working groups and meetings” yet Rivlin does so and it seems surreal. “summits”. Here are some examples of what we read here. “Weeks after the flood, newspaper boxes on street corners still taunt residents with the Aug. 28 issue of The Times-Picayune, bearing the headline ‘Katrina Takes Aim’. Workers entering an elementary school near a levee breach discover dead fish on the second floor. A man goes to mow the lawn of his disabled 79-year-old aunt and finds only lawn; her painstakingly restored home has been demolished and hauled away, the victim of a clerical error at City Hall”. Looking at class now we see that New Orleans East, a predominantly black middle class, returned much sooner than the Lower Ninth and many other “equally impoverished neighborhoods”. Homeowners benefited from the multibillion Road Home program (that had its own bureaucratic disasters), but renters a majority of the city’s residents, were excluded. Then there was the big question about the scope of the rebuilding effort. What about those New Orleanians who had lived in lower-lying neighborhoods— should they be encouraged, or forced, to move to higher ground? What many do not know is that before Katrina there were about 70,000 more people lived in New Orleans than today yet the city had declined by about a third from its peak population. The book also covers the major stories of the last five years and these include the decline in public housing stock; the anxieties about gentrification and economic inequity; the take over of the public Charity Hospital to clear the way for an extensive new private hospital complex; the revelations of profound institutional rot in the police force and prison system, (both of these have been taken up by into federal consent decrees); the persistence of an alarming crime rate; and the continued deterioration of the coastal wetlands. We see that the most expensive levee system in the world is worthless without state funding the plan to rebuild the marsh. Unfortunately, New Orleans is never just “after the flood”; it is also always before the next flood. What is so interesting is that the local economy is thriving, poverty rates are lower than before the storm, graduation rates are higher, and after a flirtation with bankruptcy the city has a surplus in the budget. New Orleans is now filled with young people, many of whom are rising to positions of influence in public life. Mayor Landrieu in his “State of the City” said, “We are not just rebuilding the city that we once were, but are creating the city that we always should have been.” “New Orleans has always been a place where utopian fantasies and dystopian realities mingle harmoniously. May New Orleans always remain so. Or at least may it always remain”. What we can learn here is that every American has to demand reform before disasters strike.This is quite a read and while for me it made my eyes tear up several times, it showed me the truth about the city I still call home. To understand New Orleans, Katrina and what happened there in the last ten years, this is the book you want and need to read. This entry was posted in Hurricane Katrina on August 8, 2015 by Amos.